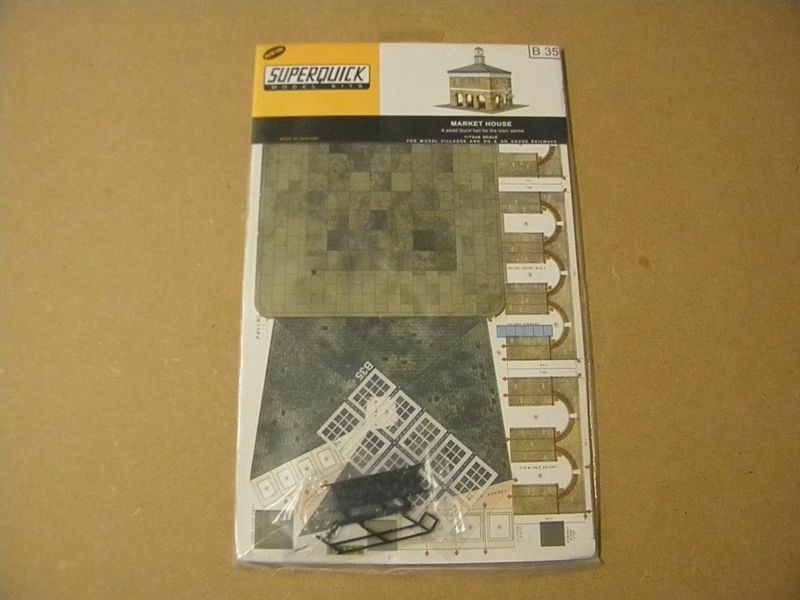 Following on from my other original Superquick builds, I thought that it might be interesting to post the build of the Superquick Market House, from their current range. 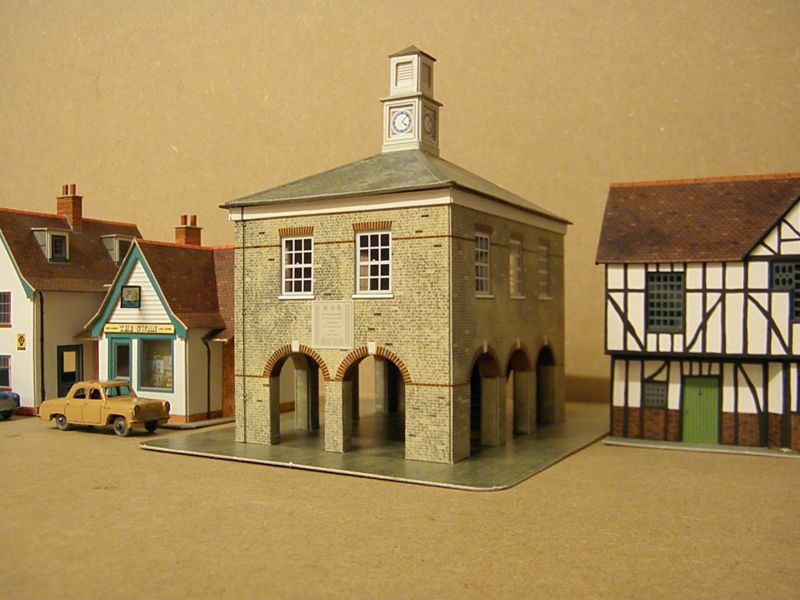 I wasn't able to find much information on-line about how the Market House would look once it was made up, so the following might be useful if you are thinking about buying the kit, or not! 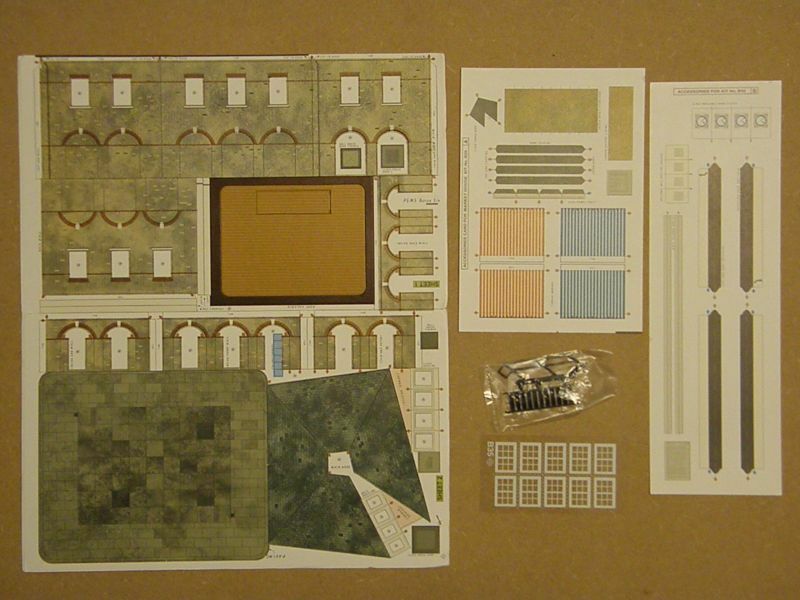 All the parts which come with the kit. 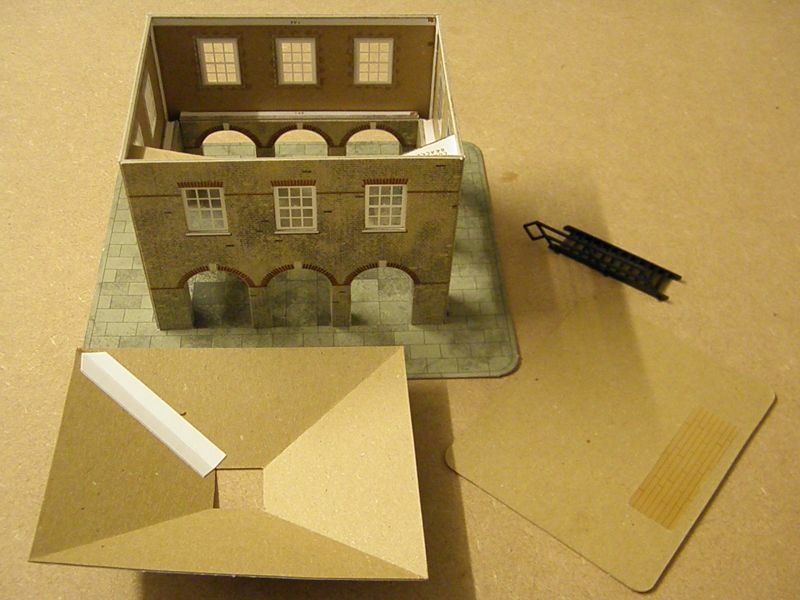 The large die-cut laminated card sheet, the thin card sheets, the windows, and the plastic steps. The inside walls were made up first. The instructions tell you to make up the first three, and then ask you to make up the fourth later on; but you can make them all up at the same time. 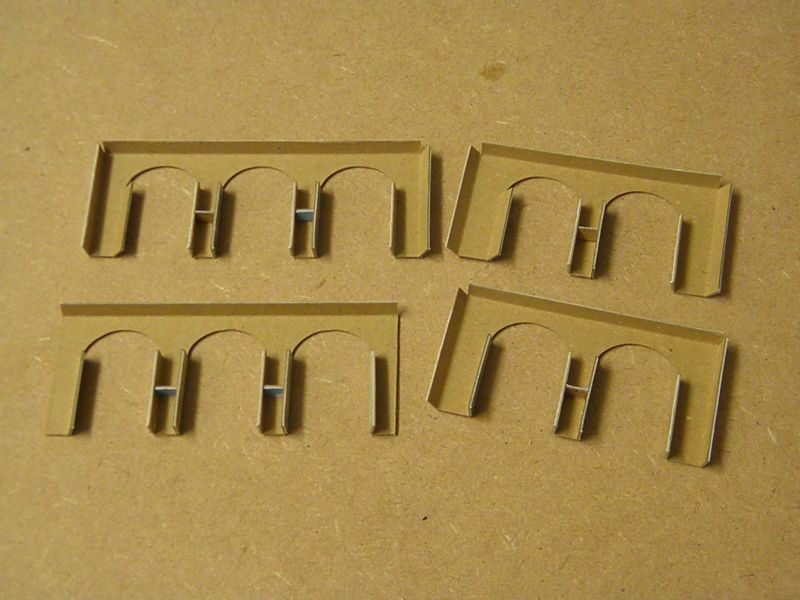 I lightly went over the scores with a knife before folding each bend through 180º. Tweezers were needed to fit the small square formers, and one had to be trimmed down a little as it was too high. Some of the arches were not die-cut through, and had to be re-cut with a knife (easy enough with a straight line, but not so an arch!). 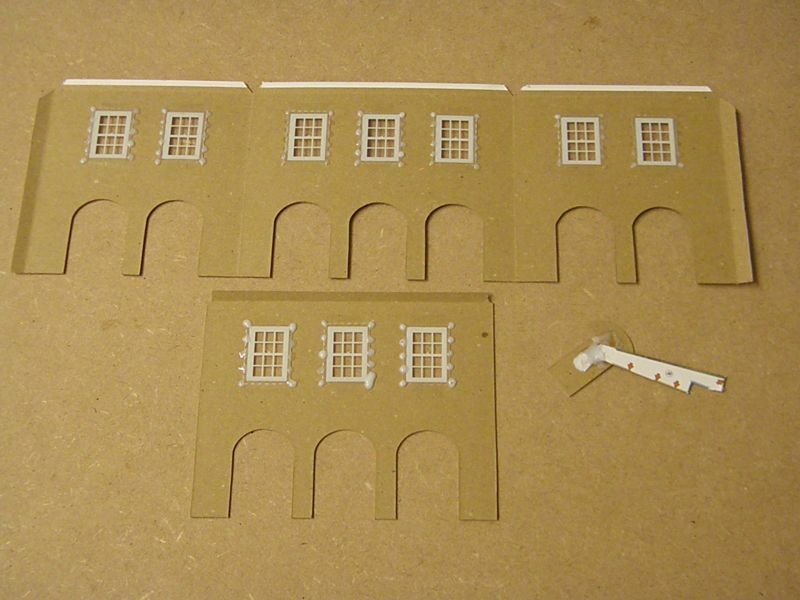 Windows were added to the outer walls using my usual method of small pieces of tape to get the positions correct, then blobs of PVA to fix the windows in place. I later removed the tape and added more PVA blobs. I have found this method to hold the windows in very well indeed. 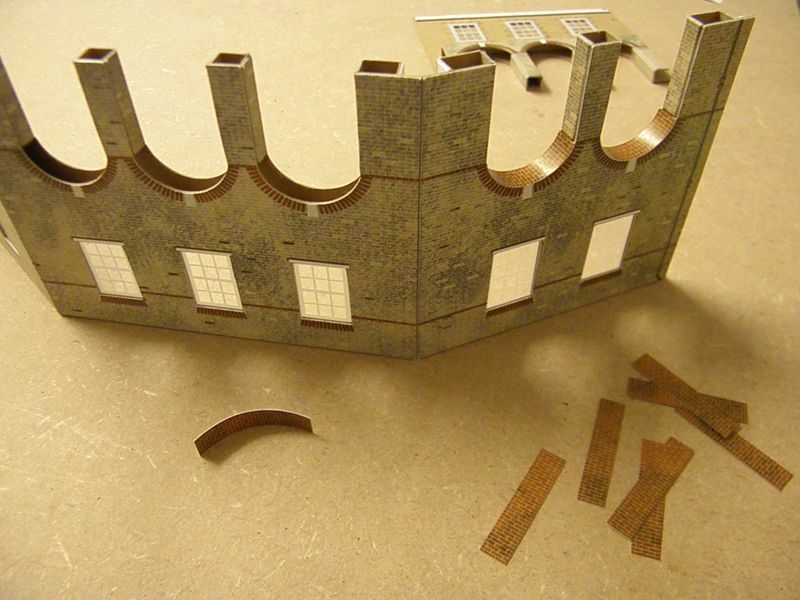 The inside walls were glued to the outer walls and left to set. The arch lining was cut from one of the thin card sheets and fixed into place with a little PVA. I found I needed to trim 1/4mm off the length of each strip. After I'd fixed them in place I wished I'd reduced the width a little too as they look a tad wide. I found that the main section would not fold up well, and that the middle inner wall was offset by 1/2mm. I removed both side tabs with a knife and trimmed a very small amount off the offending edge. The corner sectiones were added to keep everything square, and it glued up pretty well – making sure most of the PVA went where it wouldn't be seen. The completed main structure was then fixed to the base. I dribbled a reasonable amount of PVA into each leg, turned the building upright and placed it into position on the base. Some heavy books were placed on top and it was left overnight to set. The roof was made up using card waste to strengthen the join. 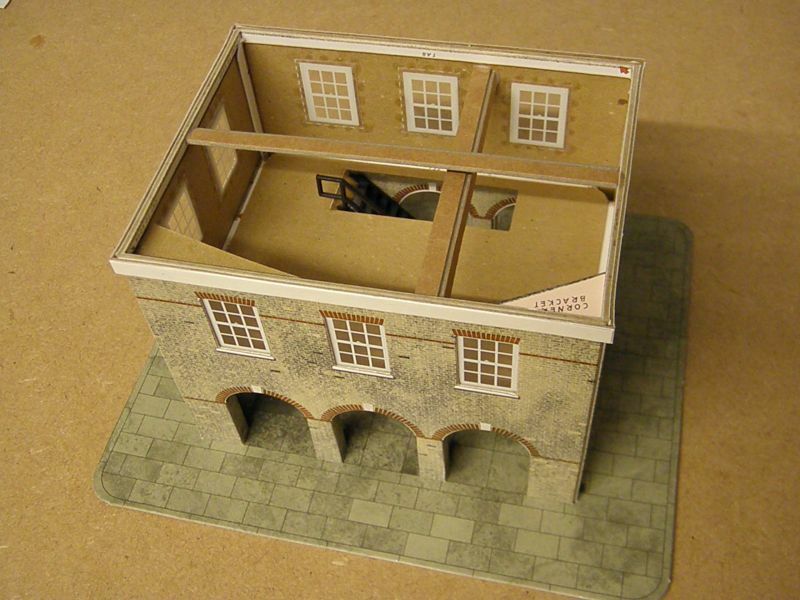 Wood effect card was trimmed down and added to the floor section. 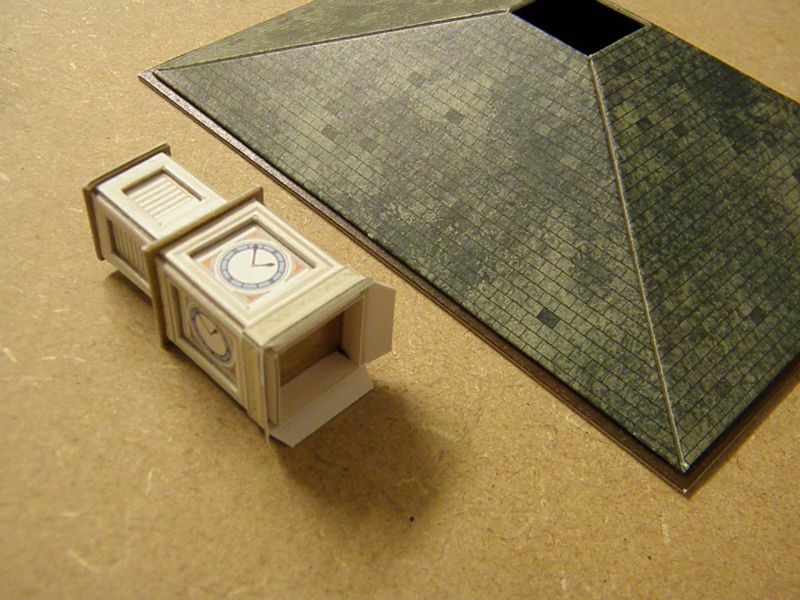 The components of the clocktower. 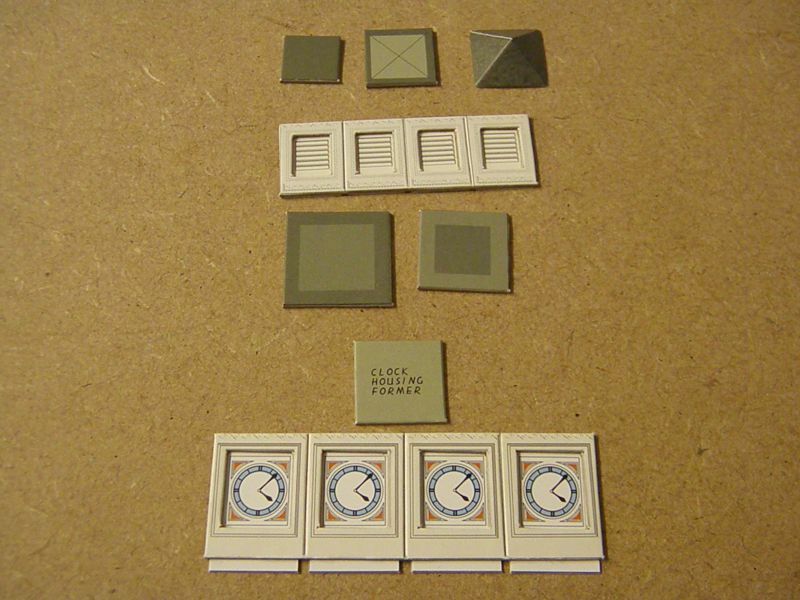 The thin card clock faces and bell housing 'slats' were fixed into place with a small amount of PVA. Once dry the tower was assembled. I decided not to use the supplied guttering, as I think that it would look rubbish. I used card strips which I understand were intended for lower down on the building. 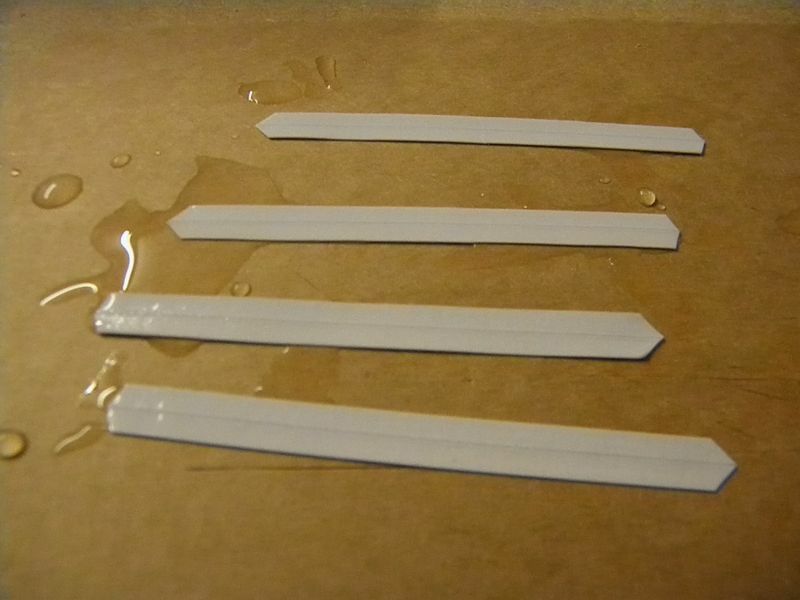 Again, these were a bit short, but a quick soak in water made them the correct length. I added some cross-members to the inside of the building to keep the walls from bowing. The ridge tiles again were a little short, but again, a quick soak in water got them to the correct length. 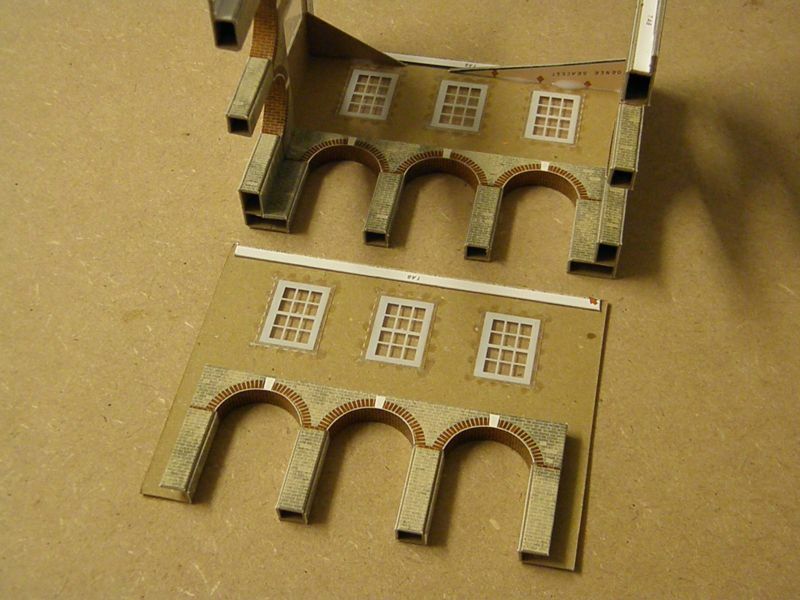 Once assembled, the exposed white edges on the arches were painted to match the bricks, and the red bricks were painted in around the corners and next to the windows. The valance on the roof was painted before the roof was fixed down. The finished building! An enjoyable build, but not without problems. The quality of the printing is as good as you can get, and the colours used look very natural. The use of light-fast inks should mean that the model will look like this for many years to come. Issues I had were generally due to the sizes of some parts being a fraction too small, and some of the cutting being a little incomplete. Thank you for taking the time to look at my build! some printed or wills plastic cornerstones would greatly enhance it. Excellent build Gordon. It really looks like the market buildings seen all over the country. I really love these Superquick buildings. They were the first card kits which I built in my teens. As you can guess, I rather like the kits too. 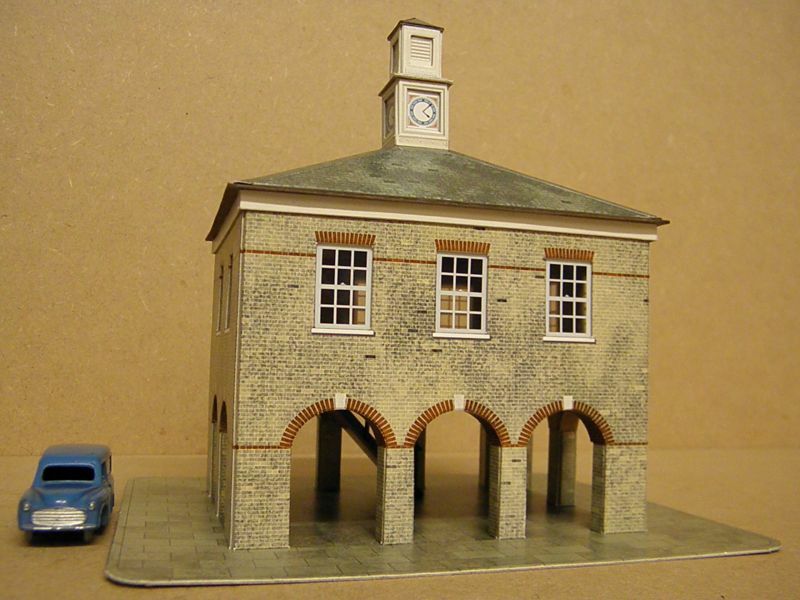 My local town, Dudley, used to have a long octagonal market building, but it was demolished around 1860! It was replaced with a posh fountain, which is still there, and is now, itself, one of the oldest things in the town centre! I'm planning one or two more Superquick builds which I hope to post soon. Your fifth picture [opened up walls] makes me think that the kit could be used opened up, flat, as the froontage of a row of shops/houses with oversailing upper floors.....Hhmmm. Well spotted Doug i see exactly what you mean could make a facade of a big building. I like the idea. You could do a long four-sided bay of shops. And use the clock tower on another building! Nice one Gordon, I'm sure I have a couple of these kits buried deep in a drawer somewhere, Must dig em out ! Good idea putting the links up! A very nicely done build, improvements and all!